Welcome to Spell Saga, the world’s first tabletop novel! Thank you for joining us After the World Ended! Because Spell Saga is unique in design, some patience will be necessary during your first game. If you are brand new to the world of The Last Minstrel, scrolling through the following Quick-Start Guide will help you understand the simplicity of the game. To Play along with the QS Guide, Separate the (6) Starting cards (see below). Then take the following 30 cards from Deck One & stack them top to bottom in the following order. This will make our QS Deck (and remember not to Shuffle the DECK while following this guide)! (for those of you on mobile, this page is best viewed by rotating your phone into landscape mode). Spell Saga is a game featuring (5) decks of cards. The story begins at Deck One ~ The Highlands, and continues with the expansions: Deck Two ~ The Forest, and Deck Three: The Caves, before finishing with Deck Four: The Ending. For advanced players wanting to know how the story truly begins, there is also an optional Deck Zero ~The Prelude. During the game you will travel the world as The Last Minstrel, searching a ruinous landscape for magical items, mysterious heroes, and powerful enemies, all in hopes of finding the truth about how the world ended. Spell Saga is something between a book of fiction, a tabletop miniature campaign, and a solitaire card game. The true point of the game is to explore, not just the world and its history, but how the player feels while playing through the story. Each game will begin by selecting the (6) cards from the Deck with a Star as a Source Cost. Every card will have a SOURCE COST in the upper Left Corner, this number (or lack of one) determines several factors during gameplay. In Spell Saga our Play Area is constructed by the cards we pull from the DECK. Each card will have a Card Type above the art, cards in Spell Saga are generally Moved into the PILE they share a Card Type with. Each time a card is Moved into the STORY PILE, you must Draw (1) card from the DECK and Move it just below, into the ARMOR PILE. Since we have started the game, and we just put a card in the STORY PILE, go ahead and Draw (1) card from the DECK and Move it into the ARMOR PILE (Face-Down) without looking at it. The ARMOR PILE is important! If you reach The End of a Turn with no cards in this PILE, The Last Minstrel card is Cycled (Moved under the DECK). The Game is Over when The Last Minstrel card is Cycled. Rule 2 ~ Rooms are placed in Numerical Order, in the direction of the Directional Compass upon them. PLACE cards represent where The Last Minstrel is Visiting each Turn (A Turn start when moving to a new Place card, and ends only when Moving to Visit an adjacent PLACE card). Some PLACE cards are also considered Rooms of one another. This is easy to spot: Rooms will share the same Card Name, have a Directional Compass upon them, and will each have a Room Number. You might have noticed in the Play Area diagram above that the PLACE PILE is generally circular. This means that PLACE card are generally Moved into the Play Area in the shape of a circle--but PLACE cards that are also rooms have the following special rule: Rooms are placed in Numerical Order, in the direction of the Directional Compass upon them. Since we have (3) room cards each called The Crumbling Tower, these are Attached together above the HERO PILE, starting with Room 1 the entrance, and ascending in the direction of each compass to room 3. When cards are kept side-by-side in this manner, it is called Attaching. Now that our Play Area is set up, we are ready to begin. Like most games, Spell Saga is played by rounds of gameplay called Turns. A Turn is composed of several mandatory steps called “Actions” that must be completed before moving from one Turn to another. A Turn starts when we Move to a Place card, and may only end after all seven mandatory steps have been completed. There are also Several Free Actions Players can perform during a Turn, examples include using an ITEM card, or Playing a card from their HAND. One last thing before we start: Spell Saga is played with tokens which represent your HERO as they progress through the world. A HERO TOKEN can be anything from a stone, to a coin, to an object of sentimental value. Every HERO in the PLAY AREA will need their own Token, so be sure to pick something unique for each one! 1) Move to an Adjacent PLACE card. Since we are just starting the game proper, we move our HERO TOKEN to Room 1 of The Crumbling Tower. When a HERO TOKEN is on a PLACE card, it is considered “Visiting” that PLACE card. This step, though mandatory, won’t affect us until we start Using our ITEM cards. ITEM cards will often need to denote usage, such as Flipping them (Face-Down) or even Cycling them away under the DECK. This Mandatory Action allows us to reset the ITEM cars in our possession each turn, so that they may be used again. 3) Read and Follow rules of PLACE card. Most PLACE cards will have rules text that affect the game while Visiting them. But when text is in BOLD, it is just a friendly reminder of the rules. PLACE cards with ~ just before their rules mean the rule is mandatory, and must be performed. PLACE cards with (&) just before their rules mean the rule is optional, and choosing to follow it is up to the Player. Next, without looking at it, you’ll Draw (1) card from the DECK for each HERO card currently in the HERO PILE. It is for this reason the game gets faster the more HERO cards you acquire. This is where the choices you make begin to matter. Cards Drawn for each HERO are either Moved (Face-Down) into the SOURCE PILE (think of this as your currency) or, you get to Move the Drawn card (Face-Up) into your HAND, where you can see what it is. Your HAND could be considered as a Shop where cards can be purchased from. In this sense, cards in your hand equal more options and opportunities, while cards in your SOURCE PILE equate to having savings in a bank. There is no limit to the amount of cards you may carry in your HAND. The SOURCE LIMIT tells us how many cards we can keep down in our SOURCE PILE, and this can be located on your HERO cards. In the case of The Last Minstrel, the SOURCE LIMIT is equal to the amount of cards in the STORY PILE. This means the more cards we have in the STORY PILE, the higher our “level” and the more “currency” we can carry. For now, let’s choose not to look at this card, and Move it down to our SOURCE PILE. 6) Draw (1) ACTION card for each HERO. The ACTION PILE represents random chance in the game of Spell Saga. Drawing an “Action Card” just means taking the top card from the DECK, and Moving it (Face-Up) into the ACTION PILE. 7) Acknowledge or Ignore cards in ACTION PILE. Each card in Spell Saga has a SOURCE COST in the top left corner. This is most often a number, but can also be a symbol (in the case of the (6) starting cards) or a BLANK SOURCE COST, which is a card the player must figure out on their own how to bring into the Play Area. *When the amount of cards in your STORY PILE is greater than, or equal to the numerical SOURCE COST of a card, it is considered Acknowledged. For example, if you drew an ACTION card with a SOURCE COST of (6), you would need to have at least (6) cards in your STORY PILE to “see” it. *When a card is Acknowledged in the HAND or ACTION PILE, it becomes available to be purchased & Moved into THE PLAY AREA, but we’ll get to purchasing cards in just a few turns. *When a card is Ignored in the ACTION PILE, it is Cycled immediately (Face-Down) beneath the DECK. Cards in HAND that are Ignored are not Cycled. The ACTION PILE also represents danger, as it’s the only part of the game where ENEMY cards can Attack your HERO. It is for this reason the game gets more dangerous the more HERO cards you acquire. Right now it looks like we’ve drawn an ACTION card that costs too much for us to see it, so we Ignore it, and the card gets Cycled (Face-Down) beneath the DECK. Much like our second Mandatory Action, this step will only affect us if certain conditions are met. In this case, there was no Acknowledged ENEMY in the ACTION PILE, so we skip this step and come to the end of our Turn. We have finished all the Mandatory Actions of our first turn, so now it’s time to start the next one by Moving OUR HERO TOKEN to an Adjacent PLACE card. By moving our HERO TOKEN to an adjacent PLACE card, we have Ended our previous Turn and are now Starting our second Turn of the game. Let’s Move from Room ⅓ - Entrance to Room ⅔ - Staircase and continue our Mandatory Actions. We don’t have any Face-Down ITEM cards yet, so let’s ignore this step and move on. Room 2/3 - Staircase has (2) Mandatory rules (we know this because they have the ~ symbol in front of them). The first one tells us to Search the DECK for every PLACE card with a Numerical SOURCE COST of (3) or less, & Move them into the Play Area. The first is that there the PLACE cards found MUST have a Numerical SOURCE COST, this means cards with a BLANK SOURCE COST do NOT count. The second thing to know is there are (4) PLACE cards in the DECK that match this rule, but you may not find them all, as there’s a very slim chance one or two of these cards might already be in your ARMOR PILE or SOURCE PILE. For the purposes of this quick start guide, we’ll say you found all (4). The third thing to know is that THIS is when the PLACE PILE becomes a circle. This is done by pretending the Entrance to The Crumbling Tower is the bottom of the circle, and the PLACE cards you just drew will make up the rest of the circle as you Move them into the Play Area (PLACE cards are added to the PLACE PILE circle wherever you like; there is no order they need to be in.). Remember to always Shuffle the DECK each time you look through it. Next we follow the rest of the Mandatory Actions. Now we have to choose where to put this Drawn card, do we Move it into our HAND and get to see what it is? Or keep it a mystery and put it Face-Down into the SOURCE PILE? Since our HERO card gives us a SOURCE LIMIT, this answer is easy: we can’t have more cards in the SOURCE PILE than we have in the STORY PILE, and since we have only (1) card in the STORY PILE, and there’s already (1) card in the SOURCE PILE from our last turn, it means we must move the Drawn card to our HAND. It looks as though we’ve Drawn another HERO card. But since it has a SOURCE COST of (4), we just keep it where it is until we have the correct amount of cards to Acknowledge it (we would have to have at least (4) cards in the STORY PILE) and Pay for it (we would need to Cycle (4) cards from the SOURCE PILE to pay for it). We Draw (1) card from the DECK & Flip it (Face-Up) into the ACTION PILE. It’s an ITEM card which costs (5). Since the card has a SOURCE COST of (5), and we only have (1) card in the STORY PILE, we can’t “See” it, and the card is Ignored and Cycled (Face-Down) beneath the DECK. The last Mandatory Action is to Battle Acknowledged ENEMY cards in the ACTION PILE, but as there are none, there’s nothing left to do except follow the second Mandatory Rule on the PLACE card we are Visiting: It tells us that when Leaving this PLACE (re: Starting a new turn) to Move the PLACE card into the STORY PILE. Now our STORY PILE has grown to (2) cards. Which means our SOURCE LIMIT is now (2) and we can Acknowledge any card that costs (2) or less. But perhaps most importantly, because we Moved a card into the STORY PILE, we get to Draw (1) card from the DECK and Move it into the ARMOR PILE. There is of course one more concern, and that is our Attached Rooms. With the Crumbling Tower's second Room card Moved out of the PILE, our HERO TOKEN is considered to be Visiting neither (until we Start our next Turn). But because the remaining Rooms of The Crumbling Tower are still Attached, we want to show this by Moving Room 3 down to connect to Room 1 (as if the tower of cards had literally crumbled shorter). Now we have a choice about where to Move our HERO TOKEN next. We have a PLACE PILE filled with cards, so what’s to keep us from just picking any (1) of them to Visit? Our Mandatory Actions tell us that to Start a New Turn, we must Move to an adjacent PLACE card. Since we were just Visiting room 2 of The Crumbling Tower, the adjacent PLACE cards would be either Room 1, or Room 3. But there’s another reason why we can only go to Room 1 or Room 3. Because we are in a set of Attached Rooms, we can only enter or exit the Attached cards by way of the Entrance card (you’ll remember that Room 1 is called “Entrance”) This means we can go and visit the rest of the PLACE PILE only after leaving Room 1. With that knowledge out of the way, let’s choose Room 3 - Treasury for our next Turn. We still haven’t used any ITEM cards, so this step is Ignored. This card also has (2) mandatory rules, just like the last one. The first one tells us to Search DECK or HAND for any ITEM card with “Broke-String Lute” in the Card Name, and if it’s Found, Move it to any ITEM PILE. Some helpful things to know: The Broke-String Lute will have a background of grey clouds, it has a SOURCE COST of (2) and is pretty easy to spot. The other thing to remember is, although rare when it occurs, if you do not find the lute, it most likely is hiding in the ARMOR or SOURCE PILE. Let’s say you find the ITEM in question. After Shuffling your DECK (because you looked through it), go ahead and Move it into the ITEM PILE of The Last Minstrel. No you have (2) ITEMS. We Draw (1) card for our (1) HERO and remember not to look at it. We could put this card into our HAND or SOURCE PILE, but since we can now carry (2) SOURCE CARDS (because our SOURCE LIMIT increased last Turn when we added another card to the STORY PILE) let’s keep the card a mystery and leave it (Face-Down) in the SOURCE PILE. SOURCE cards not only act like currency (you can think of the SOURCE PILE as a bank) but the amount carried also tells us who Attacks first in a Battle (so you can think of the SOURCE PILE as an indication of initiative--IE, who is faster, you, or the goblin you didn’t expect in the ACTION PILE). Having SOURCE cards is a good thing. Next we draw (1) card for our (1) HERO and flip it (Face-Up) into the ACTION PILE. In this case, we find an ENEMY card which costs (5). ...But because our STORY PILE is only at (2), this ENEMY card is Ignored, and Cycled (Face-Down) beneath the DECK. Now our STORY PILE has grown to (3) cards. Which means our SOURCE LIMIT is now (3) and we can Acknowledge any card that costs (3) or less. As our Turn ends, we can see the PLACE PILE has become a circle. With this, our opening turns are finished, and the real game begins. Now we have to Start our next Turn by Moving to an Adjacent PLACE card--now that the tower has crumbled, this forces us to go back to Room 1/3 - Entrance (remember, we cannot leave a Room card to visit the rest of the PLACE PILE unless we Use an Entrance card. This means that After this turn, when Moving, we can leave the Crumbling Tower and Move to any Adjacent PLACE card). We still have no Face-Down ITEM card, and so this step is easily skipped. This card has no Rules to follow, and so this step is also skipped. Since our SOURCE LIMIT is now (3) (because we have (3) cards in the STORY PILE) and we only have (2) cards in the SOURCE PILE, we get to choose whether this Drawn card goes to HAND or SOURCE PILE. Let’s say you decide to keep it (Face-Down) in the SOURCE PILE. We Draw (1) card from the DECK & Flip it (Face-Up) into the ACTION PILE. It’s a FOLK card with a SOURCE COST of (3). Since the FOLK cards has a SOURCE COST of (3), and we have (3) cards in the STORY PILE, we have to Acknowledge the card. The exception to this rule are ENEMY cards & FOLK cards, which have no PILE for their Card Type, and therefore are never purchased. So when an ENEMY card is Acknowledged, it is Battled, and when a FOLK card is Acknowledged, it may be Moved into Play Area for free and Attached to the PLACE card your HERO TOKEN is currently Visiting. We have a FOLK card who costs (3), and a STORY PILE with (3) cards in it, so we know it is Acknowledged, and since FOLK are always free to Move into play, let’s go ahead and Attach this card to the Crumbling Tower Room ⅓ - Entrance. FOLK cards are helpful during gameplay because they often help you find the cards you need to win the DECK or in many cases, transform into ITEM cards when the necessary actions are met. 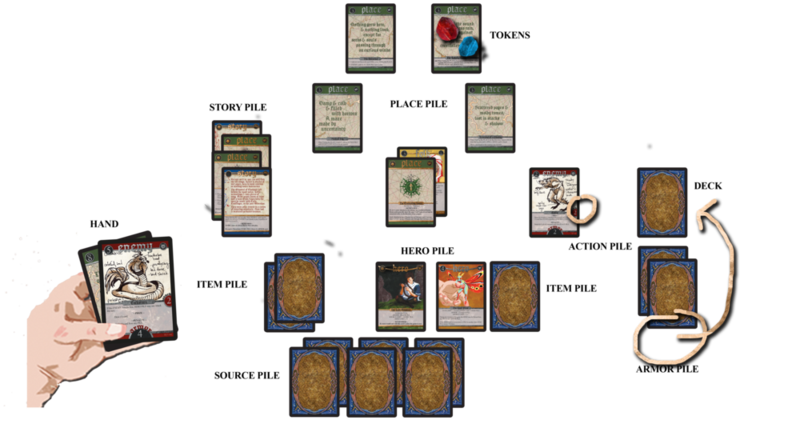 The last Mandatory Action is to Battle Acknowledged ENEMY cards in the ACTION PILE, but as there are none, there’s nothing left to do except End our Turn by Moving to an Adjacent PLACE card. Since we’re currently Visiting an Entrance card, this means we can leave the Crumbling Tower and Move on to any PLACE card to the very left or right of us. HERO TOKEN are allowed to Move clockwise or counterclockwise throughout the PLACE PILE. Let’s say we decide to Move our HERO TOKEN counterclockwise to the Right, where we chose to put the PLACE card Remains of a Library. This card has a Mandatory rule which tells us that when Visiting it for the first time, we can Search the DECK from the bottom up, and Move the first SPELL-SONG card Found into our HAND. Let’s say we do this and find The Blue Song; we then Move this new card into our HAND since the Mandatory Rule of the PLACE card tells us to do so (and then we Shuffle the DECK because we looked through it). Since our SOURCE LIMIT tells us the SOURCE PILE is currently full (because our SOURCE LIMIT is equal to our STORY PILE, which has (3) cards in it, and we already have (3) cards in our SOURCE PILE), we know that we’ll be Moving this Drawn card into our HAND (Face-Up). Look, it’s another STORY card! Let’s take a Free Action and Move it into the Play Area. STORY cards will almost always have a BLANK SOURCE COST, this just means it’s up to the player to figure out how to Move these cards into play. The easier cards will tell you in their Card Rules, but the trickier cards will make you figure it out on your own! STORY cards are also always Free to move into the PLAY AREA (and it will always say so in their Card Rules). FREE ACTION) Move card into PLAY AREA from HAND. We move the STORY card we Drew from our HAND to the STORY PILE. Remember, since we Moved a card into the STORY PILE, we must next Draw (1) card from the DECK and Move it (Face-Down) into the ARMOR PILE. STORY cards will often have special rules that affect the gameplay either the moment you play them, or, in the case of more powerful STORY cards, until another STORY card is played on top of it. The rules of this one tells us to Draw SOURCE cards equal to double the amount of cards in the SOURCE PILE (regardless of SOURCE LIMIT). Since we have (3) cards in that PILE already, we Draw (6) more cards and Move them (Face-Down) into the SOURCE PILE. Many cards either break or manipulate the rules of Spell Saga, when this happens, it is always correct to err on the side of the card and not the rulebook. We Draw (1) card from the DECK & Flip it (Face-Up) into the ACTION PILE. Since the ENEMY cards has a SOURCE COST of (3), and we have (3) cards in the STORY PILE, we have to Acknowledge the card. And since it’s an ENEMY card, this means we’ll have to Battle it. 1) When an ENEMY is Acknowledge in the ACTION PILE, each HERO card may only use (1) ITEM card until that ENEMY leaves the PILE. 2) The Amount of cards in the SOURCE PILE vs. the SOURCE COST oF the ENEMY card determines who goes first in a Battle. If you have a number of SOURCE cards which is Greater than or equal to the SOURCE NUMBER on the ENEMY card, you get to Attack first. 3) The entire HERO PILE attacks the entire ACTION PILE, the Battle is between the PILES, not individual cards. 4) Each PILE gets to Attack the other once. If the HERO PILE attacks first and defeats the ENEMY PILE, they lose their chance to Attack. Since we have an ENEMY with a SOURCE COST of (3), and our SOURCE PILE has (9) cards in it, we get to Attack first. HERO cards Attack by Using ITEM cards. It is up to you to determine which ITEM cards are useful in this endeavor. Each game you will start out with The Rusted Revolver, which allows you to Attack the ACTION PILE. According to the rules on the card, this is done by Flipping it (Face-Down) (to denote usage) which activates the ability to Cut the DECK and Attack the ACTION PILE for an amount of Damage equal to the SOURCE NUMBER on the Cut Card. Let’s say we do this and Cut the DECK, and find a card with a SOURCE cost of (7). This is our ATTACK NUMBER. The ENEMY card has an ARMOR of (2). Since our ATTACK NUMBER is far greater than his ARMOR, the ENEMY is considered Defeated, and loses it’s chance to Attack us. Next we Claim our Prize (if we had lost we would have to claim the Penalty instead) The PRIZE on this ENEMY tells us to Move it to the SOURCE PILE. Now it’s the End of our Turn, except let’s take one more Free Action to Move another card from our HAND into the Play Area: SPELL-SONG cards represents powerful magic in the world of Spell-Saga, and although they are often Free to Play, they are generally Cycled immediately after using them. Unless of course one of your ITEM cards is an instrument. The Broke-String Lute we found at the top of The Crumbling Tower is a good example of this. The Card Rules on this ITEM tell us we can Attach SPELL-SONG cards so that, when Used, they remain Attached to the ITEM and reusable each Turn (instead of being Cycled away). 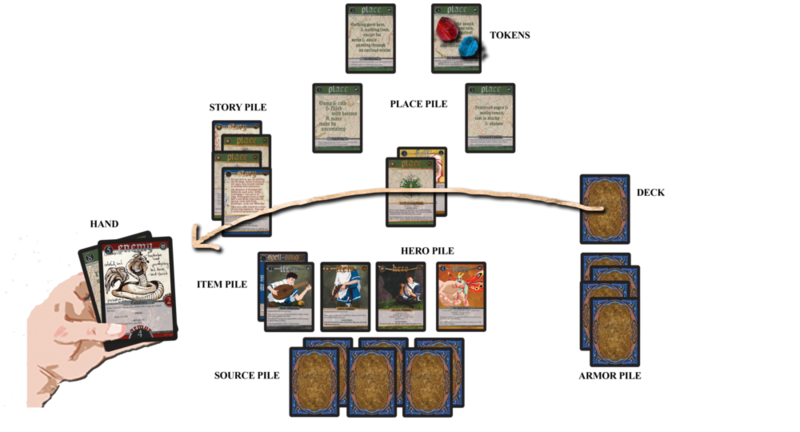 Let’s say we decide to Attach The Blue Song from our HAND to the Broke-String Lute right now (According to our HERO card, we still have an ITEM LIMIT of (6) cards for The Last Minstrel, but since this card is only being Attached to another, ti will not count against this Limit). We Start our next Turn by Moving our HERO TOKEN up to The Lonely Shore. Checking our ITEM PILE, we see that our Rusted Revolver is still (Face-Down) from our Battle during the Last Turn. By following this Mandatory Action, we get to Flip it (Face-Up) again so we can Use it again this Turn. This PLACE has a Free Action instead of a Mandatory one. We know this because it has (&) just before the rules. That means at any time during our Turn, we can choose to follow this rule once, or not at all. The rules of The Lonely Shore tell us if the amount of cards in STORY PILE is greater than the amount in ARMOR PILE, you may Draw (1) ARMOR card into each ARMOR PILE. (During the game you will collect other HERO cards to join you, in what is called a Band of Heroes. Some of these other HERO cards will have their own ARMOR PILES, and others will have what is called ARMOR NUMBERS). Since our HERO card has not been Attacked yet, and our ARMOR PILE still matches our STORY PILE, we will choose to skip this PLACE card’s Free Rules for now. Before we draw our cards this Turn, let's try adding another HERO card by taking a Free Action of our own. We still have The Lost Pixie HERO card in our HAND from earlier. By checking it’s SOURCE NUMBER (4) against the STORY PILE (4) we know we can “see” IE Acknowledge the card. And since we have an abundance of SOURCE cards in the SOURCE PILE, we know we can “pay” for it by Cycling (4) cards from the SOURCE PILE (Face-Down) beneath the DECK. Now we get to Move this new HERO card into the HERO PILE. By checking the Rules of The Last Pixie we see that it too has an ITEM LIMIT, but unlike The Last Minstrel, this HERO has an ITEM LIMIT equal to the amount of cards in HERO PILE. Since we have (2) cards in the HERO PILE, this means The Last Pixie has an ITEM LIMIT of (2). The Last Pixie also has what is called an ARMOR NUMBER. This means that is does not have an ARMOR PILE. Instead, it has the following rules: ARMOR: (2)(regenerating). This just means The Last Pixie can take an Attack of (2) before it is considered Defeated and must be Cycled. And the keyword (regenerating) tells us that each Turn this number goes back to (2), regardless of the Damage it took on the previous Turn. Another thing important to note about adding additional HERO cards to the HERO PILE, is this often grows your SOURCE LIMIT. Most HERO cards with have a small + beside their SOURCE LIMIT, which tells you how much additional SOURCE cards you can carry when that HERO is in the HERO PILE. The Lost Pixie has a SOURCE LIMIT: + (1), which just means that The Last Minstrel’s SOURCE LIMIT has grown from being “equal to the STORY PILE”, to “being equal to the STORY PILE, plus (1) additional card”. Finally, now that our additional HERO card is in the PLAY AREA, we will need an additional HERO token to represent them. This is because it is possible, and in later DECK, oftentimes necessary, to “split the party” and have HERO cards travel to different parts of the map at the same time. Now that we have (2) HERO cards in play, we’ll need to Draw (2) cards from the DECK without looking at them. Because we have Drawn (2) cards, we have to choose where they go. 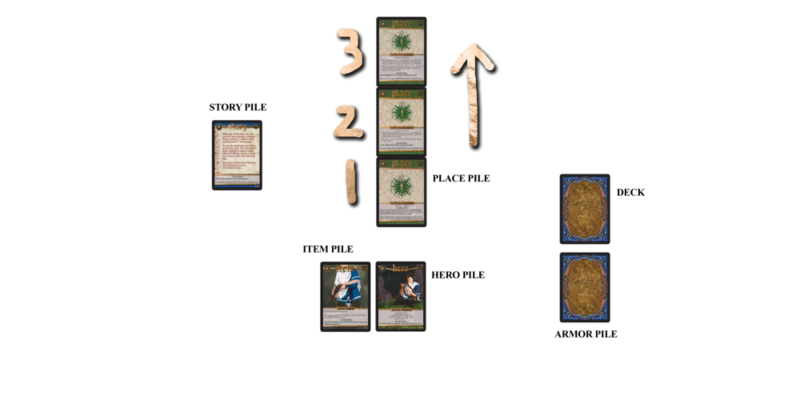 We can Move both to our HAND, or both to the SOURCE PILE, or even split them up and add (1) card to each (but since our SOURCE PILE is still higher than our STORY PILE, we know our SOURCE LIMIT is full, so we add both of the Drawn cards to our HAND). It looks like we’ve Drawn a PLACE card with a SOURCE cost of (8), and an ENEMY card with a SOURCE COST of (5). Remember, since ENEMY cards can only Attack you from the ACTION PILE, having them stuck in your HAND is the safest place for them. Since we have (2) HERO cards, we must Draw (2) cards and Move them (Face-Up) into the ACTION PILE. While this makes the game faster, it also makes it more dangerous, as we now have the chance of Drawing multiple ENEMY cards at once. Now we have (2) ENEMY cards in the ACTION PILE: A Goblin with a SOURCE COST of (2) and a Feckle-Knacker with a SOURCE COST of (4). 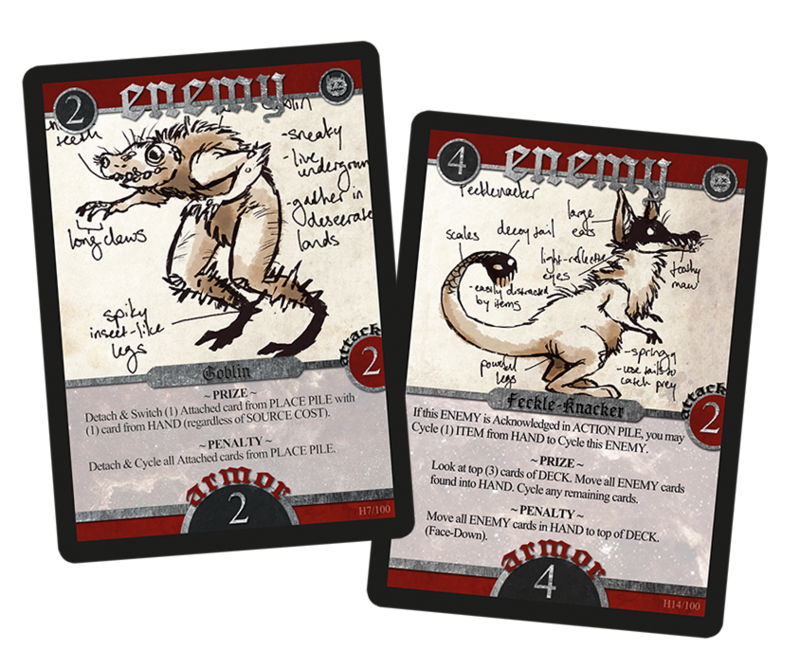 Since our STORY PILE is at (4) cards, we have to Acknowledge both of these ENEMY cards, & this means we’ll have to Battle them before the End of the Turn. Because each HERO card may only Use (1) ITEM when an ENEMY card is Acknowledged in ACTION PILE, now would be a good time to give The Lost Pixie an ITEM card to Use. Let’s Move our ITEM card The Rusted Revolver from The Last Minstrel to The Lost Pixie to help us out in this Battle. ITEM cards may be Moved between ITEM PILES at any time, but only (1) ITEM may be Moved into any (1) ITEM PILE per Turn. This is especially helpful to know when a Band of Heroes loses one of its members, and the Player wishes to keep some of The ITEM cards which would be Cycled away with a defeated HERO card. But wait! Let’s try one more trick before the real Battle commences--looking at the only ITEM The Last Minstrel now holds, we see The Blue Song, which tells us we can Use it to Increase or Decrease the SOURCE COST of any (1) card by (+1) or (-1). Since the Feckle-Knacker has a SOURCE COST of (4), and we have a STORY PILE of (4), we can Use The Blue Song to magically change the Feckle-Knacker’s SOURCE COST to (5), which means it is no longer Acknowledged, but Ignored (because we only have (4) cards in our STORY PILE, so we can’t “see” an ENEMY card which costs (5). It’s a solid plan. So we follow the Card Rules on our Broke-String Lute, which, when Flipped (Face-Down) allows us to Use The Blue Song and affect the Feckle-Knacker in the above manner. And since that ENEMY is now Ignored, we Cycle it back under The DECK (Face-Down). Now we only have (1) ENEMY card to worry about. But what if we had not done this? And Both ENEMY cards were going to Attack our HERO PILE? We would simply add both their ATTACK number together, and subtract that number from our HERO card’s ARMOR PILE and ARMOR NUMBER. If we had to ATTACK both ENEMY cards (remember, each PILE attacks the other PILE) we would Use whatever ITEM cards we could to generate Attack Numbers and then add these numbers together, subtracting them from the ARMOR number’s of each ENEMY card. But now we have (1) ENEMY card left to Battle, and (1) HERO card with an ITEM to Attack it with. So let’s check our SOURCE PILE, and see who gets to Attack first. Our SOURCE PILE is at a healthy (5) cards, and the remaining ENEMY card has a SOURCE COST of (2). This means The HERO PILE gets to Attack first. If we had to check The SOURCE PILE against (2) or more enemies, we would just compare the number of cards in the SOURCE PILE to the ENEMY card with the highest SOURCE COST. So let’s have The Lost Pixie Use it’s Rusted Revolver card. Following the Card Rules, we Flip it (Face-Down) and Cut the DECK to find our ATTACK NUMBER. But oh no! The Cut Card has a BLANK SOURCE COST. This means our ATTACK NUMBER is a zero. Remember, each PILE gets to Attack once, and each HERO card may only use (1) ITEM when an Acknowledged ENEMY card is present. Since The Last Minstrel already used an ITEM card, even if he had other cards in his ITEM PILE which allowed him to Attack, he would have lost his chance to do so after Using his Broke-String Lute & its Attached SPELL-SONG card. Now it’s the ACTION PILE’s Turn to Attack. It looks like the Goblin has an Attack number of 2. This means each card in THE HERO PILE is Attacked for (2). 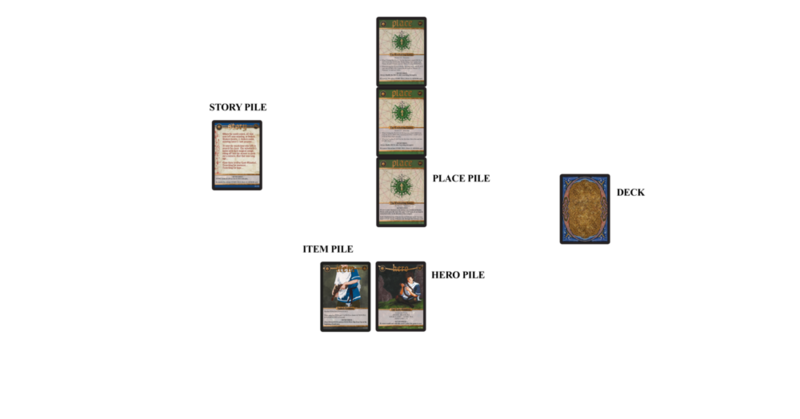 To mark this Damage, we Cycle (2) cards from the Last Minstrel’s ARMOR PILE, and note that The Last Pixie has taken an Attack of (2). Since The Lost Pixie has an ARMOR NUMBER of (2)(regenerating) this means it will survive this Turn and come back at the Start o the Next Turn with it’s health fully restored. Next we have to claim the Penalty of the Goblin, which tells us to Detach & Cycle all Cards from PLACE PILE. This will send our FOLK card (Face-Down) beneath the DECK. And at the end of the Battle, we must also Cycle the Goblin (Face-Down) beneath the DECK. And that could be The End of our Turn...except if we remember the Card Rules of the PLACE card we are Visiting, we can now Draw (1) ARMOR card, as our ARMOR PILE is now less than the STORY PILE. With our first (6) Turns accomplished, we can now move on to explore the rest of The Highlands. This concludes The Spell Saga Quick-Start Guide.